So many of our friends are having a rough time. Ginger Jasper isn't well, Lucy isn't feeling so hot either, and poor little Emma died last week leaving Herman and Karen Jo broken-hearted. We're purring for them all. To cheer us up, we've made a silly joke. Here's to better news today! Haha! Looks like you were fit to drop. We are purring for all our sick friends too. You guys are working hard!!! We are thinking of all those who are not well. My human thinks it is a good thing she does not have a treadmill here - she might never get her turn to use it! We have been quite distressed at how many of our friends are feeling poorly. That is how my Dad exercises! We sure are purring for everyone. We too are crossing our paws for all those who are sick. 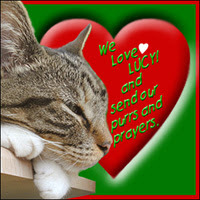 to all kittehs and humans: hope all is well with u guys!! Ha! Ha! There is a exercise machine in the basement that only me and Kozmo uses! Ha! Thanks for the laugh today!! We sure needed it!! That must have been some workout! We're purring for our sick friends too and hope they all get better soon! Good one, you two! We are purring for the health of all our friends. It's always distressing when so many kitties (and other Beings) are sick or have passed. We're purring for all in need. BTW, we like your idea of how to keep fit. The mom thinks she'll try it. LOL!!! That is the bestest use of the treadmill ever! Yay! 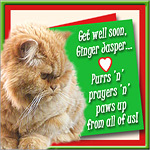 I hope Ginger Jasper sees this and has a smile. I am so worried about him. That looks a very good way to keep in shape. ps Lucy says thank you for your kind wishes. We are smiling big! A joke now and then is really needed. We are remembering all those who are having tough and sad times right now. Our hearts and prayers go out to them. Ahhhh, the aftermath of hard exercise! LOL! That's a good one, Target! it is sad to see so much hurt out on the CB....but love the funny of you boys on the treadmill - putting it to its best use!! 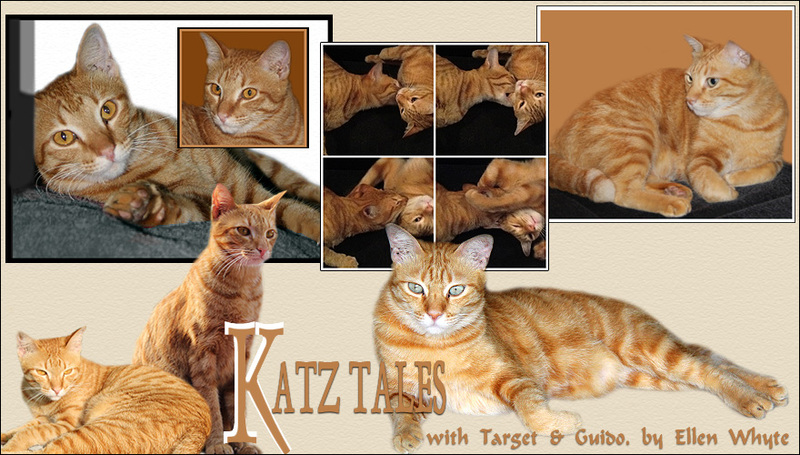 Sorry to hear about all the fur-rends not doing so well and our purrs go to them too. Love the little joke! ha ha! That does cheer us up! so sorry for all the sadnesses. That's the ideal gymnastic for me !! You guys no wonder you look fit. The secret's out now! Ha ha! This is so funny! I'm following you on Twitter now, too! Sports are fun especially when you're with your friends!